The Forte5 SX is really a blast to drive. Though it's not as taut as a VW GTI or communicative as a Focus ST, it's still pretty damned entertaining for the money. Ride Quality: The car feels solid over bumps, and the sport-tuned suspension doesn't rock your boat at all. The chassis is really very good. Acceleration: 0-60 happens in a respectable 6.6 seconds, but it feels faster thanks to the great manual transmission and light clutch. Just don't get on the gas too hard off the line since you'll spin the tires. There is some mild torque steer, but it's more than manageable. Braking: The SX gets upsized front rotors, and the brakes feel good. Stopping distances, however, could be better. Steering: The SX also gets a quicker steering ratio. The steering, however, lacks feedback. Handling: Minor body roll, but all is kept well in check thanks to a sport-tuned suspension and big wheels and tires. It handles the curves very well. 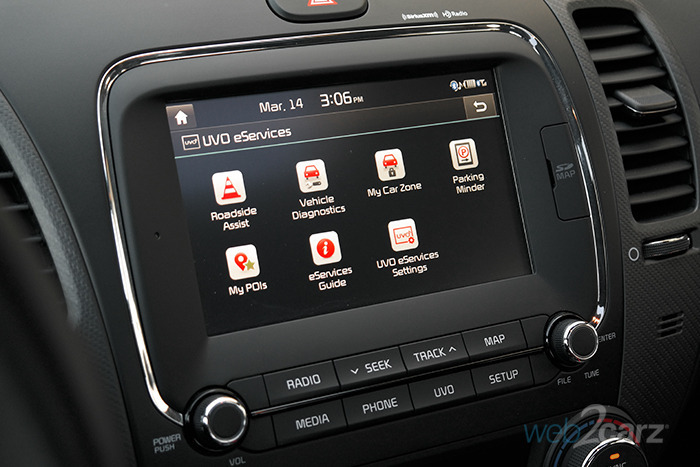 We are big fans of Kia and Hyundai infotainment systems since they're easy to read and use. The level of in-car tech is pretty good, but the system could use a visual overhaul. Infotainment System: The standard 7.0-inch touchscreen is easy to read and decent with response. Icons are on the small side, though. It does have Android Auto and Apple CarPlay compatability, and ther's a nice 4.2-inch color LCD display in the gauge cluster. 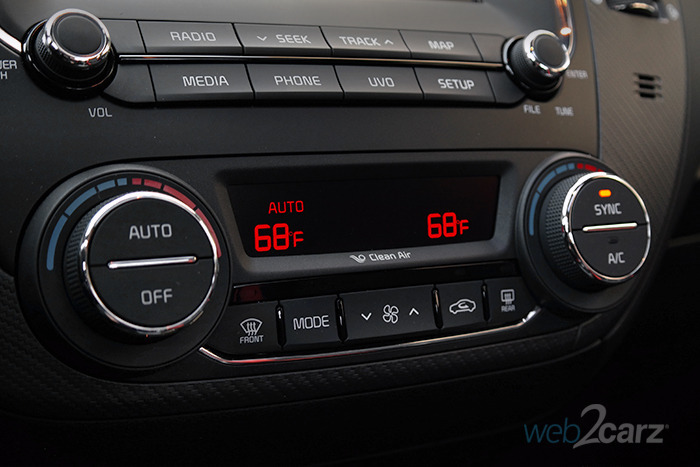 Controls: The presence of physical knobs for audio and climate keep the systems easy to use while driving. They are also well-placed. The SX trim is clearly the best-looking, sportiest version of the Forte 5, and it gets better touches that help it look more aggressive. It's too bad the interior isn't up to par, which brings down the score. Front: The black mesh tiger nose grille that connects with the wide wraparound HID headlights gives the front end a handsome look. We also like the red line that bisects the lower fascia grille. 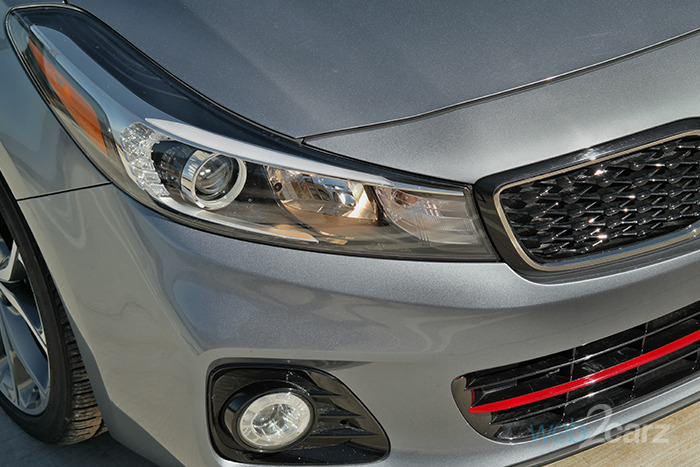 The SX trim gets a different front and sporty round fog lights along with black side mirrors. Rear: It kind of looks like a Ford Focus but actually a bit better. The wide taillamps look good, as do the SX trim's round, dual chrome tailpipes. Profile: The side view looks handsome and well proportioned, if not distinct. The 18' wheels are a nice touch. Cabin: The cabin is a bit of a mess styling wise with weird dash scalloping that looks busy, and the fake carbon fiber is poorly done. The center stack also looks cheap and unnecessarily big. The red trim on the seats, though, is a nice touch, as are the great aluminum sport pedals. 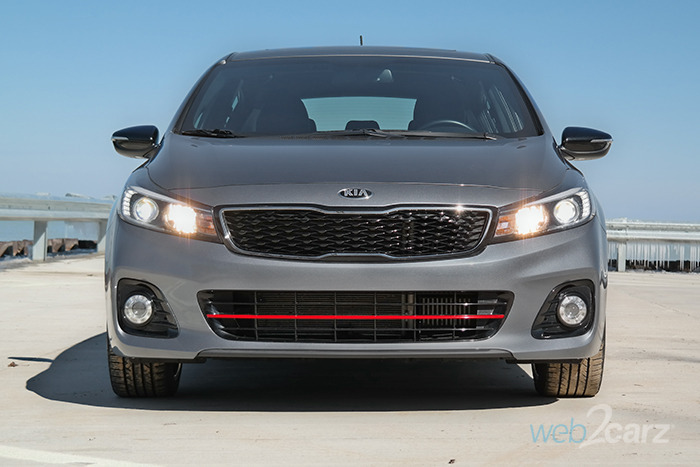 Though there's a good amount of space, the overall comfort level in the Forte5 could use some help. Most occupants will find it just fine for commuting, but longer distances could present a challenge. Front Seats: The seats are too high for a sporty hatchback, and they're on the hard side. At least the bolstering is decent. 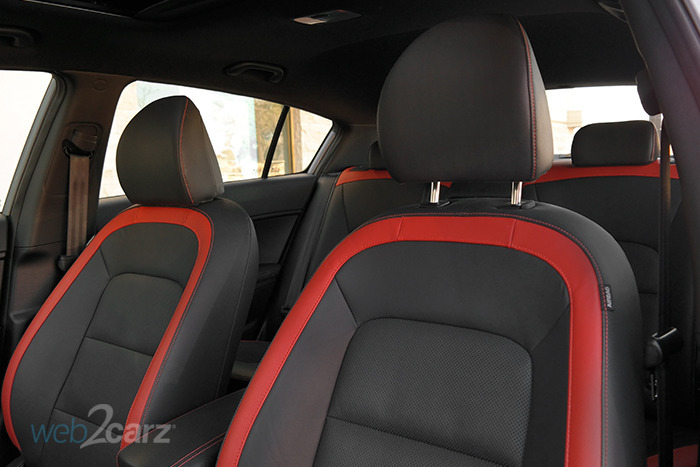 Rear Seats: The back seat is actually quite roomy, and tall adults can sit back there without a problem. NVH (noise/vibration/harshness): The cabin is quiet and keeps noise at bay even at highway speeds. There were no vibration or squeaks to be heard. Visibility: The low hoodline lets you place the car easily, but the C-pilllars are pretty thick, making the rear camera vital. Climate: The climate system, heated/ventilated seats work very well, and we had no problem getting comfortable. The Forte sedan was tested, but since the cars share the same platform, they pretty much rate the same. It nails the crash testing results, and buyers should take heart that the car will protect them well. Solid accident avoidance tech is avaiable, as well. IIHS Rating: For 2018, the Forte gets a Top Safety Pick+ rating, scoring 'good' in all crash tests except an 'acceptable' in the passenger small front overlap test. 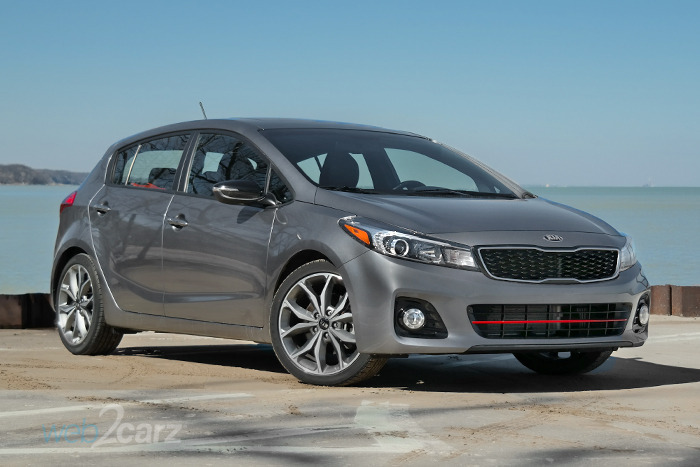 NHTSA Rating: The Kia Forte earns 5 stars in crash testing. Standard Tech: Our tester came standard with a rearview camera and a tire pressure monitoring system, in addition to ABS, traction/stability control, and airbags. Optional Tech: None, though features like rear cross traffic alert, lane change assist, and blind spot detection are available. There's ample room inside the Forte 5, especially when the rear seats are folded flat, and like most Korean cars, the cabin provides good space for smaller items. Storage Space: The large binnacle below the center stack is excellent, even for larger smartphones. The small compartment aft of the shifter is goo dof change and keys. Cargo Room: The Forte5 has 23.2 cubic feet behind the second row, pretty much average for the segment, but drop the seat down, and you get a whopping 56 cubic feet, besting competitors. Fuel economy numbers are more than respectable here, even under fairly hard driving. More conservative driving should get owners to the EPA estimates. Driving Factors: We drove pretty aggressively on local roads, and also spent a fair amount of time highway driving. 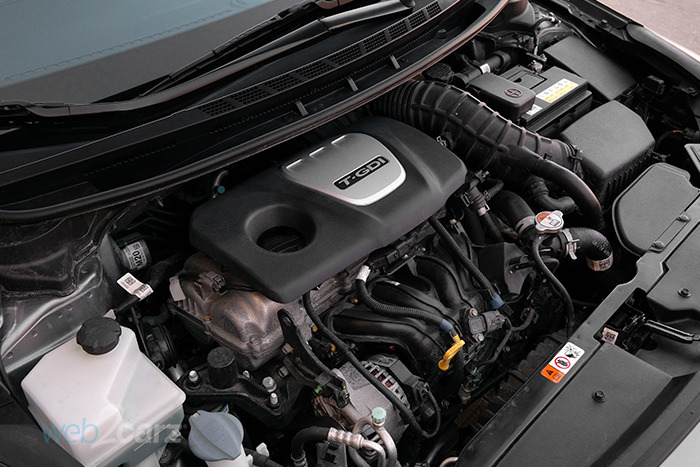 The base system on the Kia is pretty good for six speakers. There appears to be no upgrade option. Final Thoughts Performance leaning hatchbacks, not true hot hatches, are an excellent choice for enthusiasts on a budget, and the Forte5 SX is a very good choice thanks to its good balance of style, driving dynamics, and space. It's too bad the interior knocks it down a couple of notches, as it needs to be cleaned up and made less busy. The backing of a great warranty and a good reliability rating as a brand means buyers can purchase with peace of mind and then make the commute more fun than usual.